Corporate social responsibility (CSR) is increasingly regarded as a compelling strategic opportunity for dealing with sustainability challenges faced by organisations. Design has the potential to translate CSR strategies and tactics into manufactured goods, as well as potential services. This article focuses on (i) investigating design activities that enable the application of CSR principles, during new product and service development, (ii) identifying the designers’ underlying motivation for socially responsible design (SRD) decision-making in organisations. 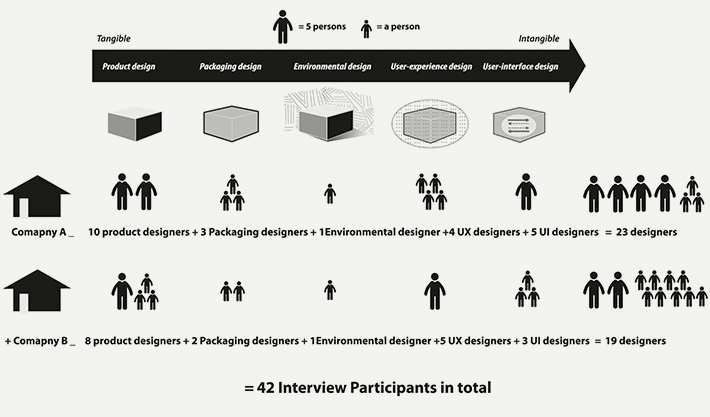 To investigate CSR and SRD we interviewed 42 designers in two South Korean multinational electronics company. Grounded theory was used to explain the reasoning behind the SRD decisions and their possible implications. 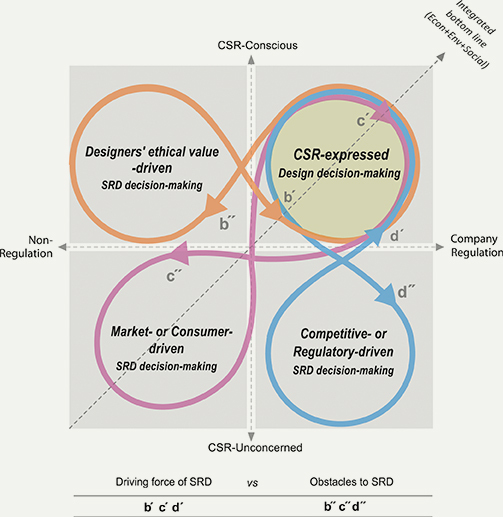 This article presents a two-dimensional model comprising of two continua, one which is the degree to which SRD decision is motivated by a designer’s personal ethical value system, and the other of which is the degree to which it is motivated by a company CSR regulation. The empirical study illustrates how the theoretical model can capture the complexity of SRD decision-making within organisations and how the underlying motivations serve as impetus for the CSR-expressed design decision-making and operate as the initial stages of transition SRD practices into the mainstream CSR discussion and policy. Keywords – Socially Responsible Design (SRD), Design Decision-Making, New Product Development (NPD), Corporate Social Responsibility (CSR), Creating Shared Value (CSV). Relevance to Design Practice – The work described not only exemplifies the design activities that enable the application of CSR principles, but also illustrates how designers are, in practice, motivated for SRD actions. This article provides rich empirical knowledge of the drivers of and barriers to developing and implementing SRD within organisations as well as to provide key understanding to theoretical ideas about CSR-expressed design decision-making, in the electronics sector. Citation: Yoori Koo (2016). The Role of Designers in Integrating Societal Value in the Product and Service Development Processes. International Journal of Design, 10(2), 49-65. Received September 24, 2015; Accepted May 4, 2016; Published August 31, 2016. Copyright: © 2016 Koo. Copyright for this article is retained by the authors, with first publication rights granted to the International Journal of Design. All journal content, except where otherwise noted, is licensed under a Creative Commons Attribution-NonCommercial-NoDerivs 2.5 License. By virtue of their appearance in this open-access journal, articles are free to use, with proper attribution, in educational and other non-commercial settings. Dr. Yoori Koo is an assistant professor of service design and design management at Hongik University. Her PhD in design management was completed at the Lancaster University, in which she investigated how design and human-centred design thinking might lead to more sustainable products and services in organisations. Her work brings new and important insights to the existing literature – especially on the role of design management and the importance of organisations taking seriously the critical contemporary issues of Corporate Social Responsibility and Sustainability. She is also a Public Service Design Consultant in the National Human Resources Development Institute in South Korea. In recent years, along with the ever-strengthening regulations around the world, the term corporate social responsibility (CSR) has become a buzzword in the business world. However, its practical meaning and application are still unclear. Since the 1970s, there have been continuous attempts by designers to enhance the environmental and social impact of the products they create. Many studies argue that designers have an opportunity to influence the development of socially responsible products by virtue of their role in the early stage of the product development process. It is in this early stage where the most crucial decisions are made with respect to cost, appearance, material use, the manufacturing method, performance and quality are made. Simultaneously, these are the factors that directly influence the impact that products and services have on our society and the environment (Esslinger, 2009; Fiksel, 2009; Morelli, 2007; Shedroff, 2009; Van Hemel, 1998; Whiteley, 1993). Indeed, the field of design (and all of its subsidiary or associated professions: architecture, industrial design, interaction design, engineering design, etc.) have increasingly become a major focal point for CSR, which is not surprising since poorly designed industrial systems, products, and buildings can greatly contribute to environmental and social degradation (Stegall, 2006). While we argue that it is crucial for social and environmental concerns to gain much more attention when establishing strategy and designing products we note that relatively few companies display this capability and build CSR thinking at an early stage of product development. In fact, currently, the societal aspects of design are seldom addressed in design briefs in organisations (Dewberry, 2000; Lofthous, Bhamra, & Sares, 2001), and designers are, therefore, rarely allowed to engage with environmentally and socially responsible decision-making and design practices in an organisational context (Bhamra & Lofthouse, 2007). While commercially driven, client-led design is most suited to incremental changes, the idea of responsible design thinking attempts to account for the often radical ways in which design is now being used as a form of direct action, to transform society and the ways in which we live, both now and for the future (Chick & Micklethwaite, 2011). For this reason, people in organisations might think its goals often run counter to the dominant and sometimes all-encompassing commercial priorities of market-led design. Indeed, there exist a number of challenges to developing socially responsible design in organisations. In our research we analysed the experience with the integration of SRD made by corporate designers in order to investigate how best to incorporate CSR thinking into design and use it to deliver CSR philosophy in organisations. This article, however, does not seek to determine precisely what a socially responsible design approach will be, but rather, to understand what it could be and develop steps to move toward that possibility. The purpose of this paper is to propose a new typology of designers’ SRD decision-making behaviours based on our analysis of their underlying motivation dimensions. Thus, this study presents three types of approaches for SRD decision-making and subsequently illustrates how the underlying motivation of individuals serves as an impetus for CSR-expressed design decision-making within an organisation. The article is structured as follows. First, a background to the study is provided, and this study’s arguments are developed by exploring the literature of socially responsible design (SRD) and CSR management; next this study’s research analytical framework and method are explained. Subsequently, this paper describes the findings in terms of the relationship between the SRD decisions, designers’ underlying motivations and the implications of their decisions, as evidenced through a number of socially and environmentally conscious design practices in the two selected companies. The drivers for and barriers to implementing and developing SRD are also unravelled and discussed. This paper concludes with a discussion of the three major contributing factors that underpin designers’ SRD decision-making in an organisational context, followed by managerial and theoretical implications drawn from the study findings. Design’s response to social responsibility, in parallel with business’s response, has reflected the great activist movements. Indeed, it has been a recurring theme; with designers addressing issues relating to social responsibility (Whiteley, 1993). Since the 1960s designers have actively considered design’s wider implications for society. Numerous terms have appeared in the literature of ‘socially responsible design (SRD)’, including green design, ethical consumerism, eco-design, sustainable design, universal design, inclusive design, etc. In the 1970s designers were encouraged to abandon ‘design for profit’ in favour of a more compassionate approach inspired by Papanek (1971). In the 1980s increased consumer and business interest in green issues gave rise to ‘green design’ which considered single issues, such as energy efficiency or recyclability (Moreli, 2007); in the 1990s the focus moved to ‘eco design’ which considers key environmental issues throughout the product life cycle; around ten years later the concept was gradually refined though the ideas of ‘sustainable design’ which incorporate the consideration of social issues in addition to the environmental considerations (Doordan, 2013). Over the past few years, several approaches have emerged that challenge the sustainability agenda and look beyond eco-efficiency. ‘Design for social innovation’ (Manzini, 2007), for instance, emphasises the role of designers to empower people’s own capabilities to solve their own problems in their local contexts, while ‘transformation design’ focuses on the practice of design thinking for societal transformation in local context (Burns, et al., 2006). These recent approaches possibly exemplify how the designer’s responsibility and the contribution they can make to society, our lifestyle, and the environment has increasingly widened from what was initially suggested by Papanek (1971). As it became recognised that designers can directly and indirectly influence the environmental and social performance of products and service as well as the way in which new processes, services, and products are delivered, research began to focus on how the concept of SRD can be integrated into industrial design practice. Empirical research indicated that designers were lacking appropriate information, inspiring examples, and guidance on how to incorporate SRD into their work (Lofthouse, 2001). It was also recognised that designers were not typically involved in strategic decision-making in organisations (Dewberry, 2000; McAloone, 1998). The more fundamental problem is that, design is, in most cases, a service for hire and designers are usually employed by a client or company to work on a project that they did no initiate (Fuad-Luke, 2009). Put it in another way, social responsibility in part originated from the individual ethical values of designers, but it is also a response to the needs of their clients or willingness of the organisation they are belong to (Cooper, 2005). In order to better explain about the underlying motivations for SRD decision-making, this paper suggests a conceptual framework of SRD motivations that can help explain the designers’ actual behaviours in SRD decision-making in an organisation. The existing literature on SRD does not clearly conceptualise the underlying motivations for SRD decision making within the context of organisation, nor does it offer a clear definition of SRD rather it uses the term flexibly. As BS 7000-6 Guide to Managing Inclusive Design indicated, there is a common misconception that managing design is straightforward extension of design practice. Given the crucial influence of those who manage design activities on their outcomes as well as company-wide efforts to address CSR as well as SRD, the current study adopts a concept of the strategic management of CSR from the business ethics discipline. Following Porter & Kramer’s (2006) theory of creating ‘shared value’, this study defines the “company regulation” as company’s regulatory efforts to create economic value in a way that also create value for society CSR, prompting employees to behave in socially and environmentally responsible ways and maintain or sustain the direction of its behaviours. Based on the previous literature, this study also uses the term “CSR-conscious” to refer to attitudes and behaviours of individual designers in terms of CSR/SRD. Based on the two distinct dimensions, the current study focuses on identifying distinct levels of SRD decision-making and the related individual and organisational factors that affect them. Previous research indicated that design decisions have a number of significant manufacturing and non-manufacturing impacts upon the life-cycle of the product (Dowlatshahi, 1994; Fiksel, 2009; Morelli, 2007; Van Hemel, 1998; Whiteley, 1993). It has been also recognised that the earlier environmental and social factors are considered in the design process, the greater the possible cost reduction and enhanced performance of the products (Bhamra & Lofthouse, 2007). This is especially the case for companies that are involved in product manufacture. This implies that designers need to better understand the negative environmental and social impact of the products and services they produce and also understand how to make the required changes to develop products and services which contribute to sustainable business (Shedroff, 2009). There is also increasing recognition among companies of the potential of design thinking. This means that designers have a wide range of fields and opportunities to innovate, to be creative and to participate in achieving the radical transformation of the business model, including changing values, behaviours, and infrastructure. Designers can be part of the development of a socially responsible business system by providing a sustainable perspective and way to understand production and consumption of products and services (Vezzoli & Manzini, 2008). In essence, designers can play a vital role in translating specific CSR commitments into actions (Cooper, 2005). This implies that the achievement and quality of SRD will significantly depend on levels of CSR/SRD awareness or the altruistic/humanitarian motivations of the chosen individual designer(s). Recent studies about firms’ strategic initiatives in regard to CSR programmes emphasise that in order to empower employees to practice CSR programmes, which are of strategic interest for an organisation, firm level corporate social responsibility initiatives are vital (Swanson, 2014). Notably, top-level corporate leadership is imperative not only to create and define the culture of CSR excellence, but also to reinforce the importance of corporate commitment to CSR programmes (including developing socially responsible products and services) that involve both short-term and long-term benefits and risks (Waldman, Sully de Luque, Washburn, & House, 2006). Many CSR researchers emphasised that to become a fundamental aspect of business operations, the strategic vision of CSR needs to be consistently expressed by senior leaders and articulated by company policies and guidelines (Karna, Hansen, & Heikki, 2003; Rowe, 2006). Furthermore, given that shared value opportunities are frequently raised in business and manufacturing operations, there may be some inherent conflicting priorities between business managers whose primary concern is economic value (i.e. productivity and efficiency) (Porter & Kramer, 2002) and designers whose primary concern is ‘users’ or ‘consumers’ (Buchanan, 2000; Press & Cooper, 1995). However, if CSR programmes are initiated by top-level management, these conflicts of interests are less likely to occur (Rangan, Chase, & Karim, 2015). Setting a clear regulatory strategy for CSR-related programmes is particularly critical during the budget approval process for SRD initiatives, since some of these programmes will not result in any increased company revenue in the short term. As such, CSR professionals consistently point out corporate self-regulation through voluntary standards setting and corporate codes of conduct as the crucial factor for enabling, guiding and nurturing CSR initiatives, including SRD (Wheeler, Colbert, & Freeman, 2003). Keeping the above literature review in mind, a two dimensional model of SRD decision-making is proposed. The model is depicted in Figure 1 and has four distinct quadrants. Figure 1. A Two dimensional model of SRD decision-making. Quadrant A. Company-regulated, CSR-conscious design decision making: In this quadrant, both organisations and individual designers are consciously aware of SRD decision-making and they engage in formalised discussions about SRD. Businesses adopt some degree of voluntary regulatory standards as a part of their genuine commitment to social responsibility. 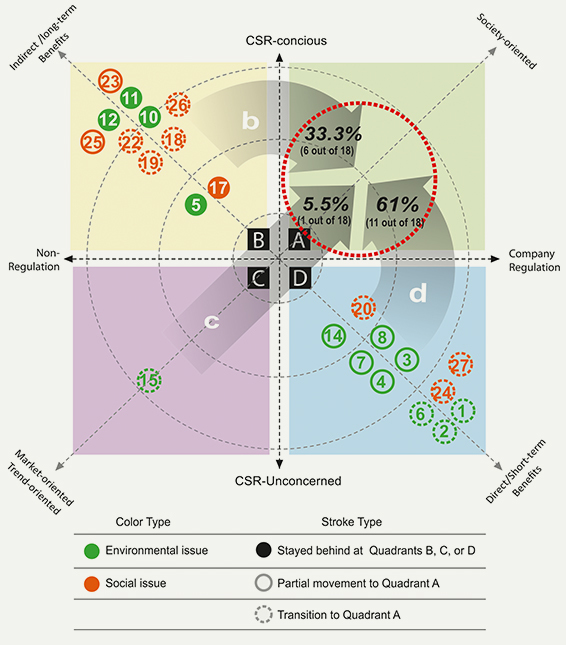 Quadrant B. Non-regulated, but CSR-conscious design decision making: This is concerned with a socially-conscious, designer-led approach toward SRD in which there is no company regulation related to SRD, yet individual designers try to make decisions in socially-conscious ways based on their personal ethical value system, going beyond a narrow view of company regulation. Quadrant C. Non-regulated, CSR-unconcerned design decision-making: This view captures a perspective in which a business has no provision to look beyond a narrow view of profit maximisation. From this perspective, any part of socially responsible design decision making is socially unconcerned and non-regulated; rather it can often be seen as a response from the market which is actually a market or consumer-led approach. Quadrant D. Company-regulated, but CSR-unconcerned design decision-making: In this quadrant, corporations tend to follow existing guidelines and regulations to fulfil minimum CSR criteria, and designers develop products and services only in a manner that adheres to the company’s legal and economic responsibilities. This study employs a case study approach and processes based on grounded theory for several reasons. Firstly, it was important for us to study designers’ perceptions, actions, and engagement in a process. Secondly, the context of organisation was important for understanding a phenomenon. Thirdly, grounded theory enabled a more detailed analysis of the data set and allowed the theory to evolve from the data, while the case study approach allowed for a focus on context and real, tangible examples. While a case study method has advantages in that it concentrates on studying situations more in-depth, attempting to grasp its holistic richness and complexity (Yin, 2003), it is often criticised for its lack of rigour and the tendency for a researcher to have a biased interpretation of the data (Robson, 2007). A common criticism of case study method is its dependency on a single case exploration making it difficult to provide a generalising conclusion (Tellis, 1997). As the quality of a research is often related to generalisability of the result (Stenbacka, 2001), the ability to generalise findings to wider groups and circumstances is deemed critical to a case study approach (Yin, 2003). To minimise the negative aspects of the case study approach we employed a comparison design and conducted an in-depth interview with designers in the two different companies. The purpose of the comparative case study is not only to identify individual case pattern, but also to note commonalities and differences found when comparing the cases (Lapan & Quartaroli, 2009). In particular, we used a constant comparative method where a researcher begins with a theory or a model and checks each case or each datum against it (Glaser, 2001). Thus, this research was undertaken to identify the different focus of SRD decision-making in the two firms, demonstrating their similarities and differences, thereby suggesting the drivers and barriers to developing and implementing SRD within the organisations. Theoretical considerations are also important in the selection of the sample for qualitative study (Ambert et al., 1995). As we were interested in the phenomena at the organisational level, the first consideration was to find two organisations that were from the same industry sector. We also look for comparable company size, public or private ownership, geographic coverage, and so on (Benbasat et al., 1987). For the purpose of the investigation, the electronics sector was identified as the industrial limiting factor with two important theoretical considerations: i) technology is advancing very quickly, and therefore many products are short-lived, causing a huge e-waste problem; ii) the environmental and social issues are more associated in the electronic industry, which is directly related to CSR. With respect to geographic coverage, South Korea was selected primary because of the country’s status as a newly industrialized one in which large established firms are rapidly globalizing and increasingly involved CSR. Finally, regarding the size of the business, multinational companies were chosen because (i) the influence of multinational companies is increasingly important for both local and global society, gaining attention in CSR related research (Visser, 2008), (ii) they have arguably a good CSR record (GRI, 2012; Greenpeace, 2012) with a high market share in the electronics industry and last but not least they provide conveniently accessible data. With these criteria of site selection in mind, the two multinational electronics companies in South Korea (hereinafter referred to as “Company A” and “Company B”) were chosen. This study included a group of designers as a primary source of information using in-depth interviews. The focus of the interviews with them was to identify the overall design development practices supporting CSR. The specific issues included the topics of ‘what environmental and social aspect of design can be associated with CSR’ and ‘how they consider CSR-related issues or designer’s social responsibility in the development of new product and service’. A series of semi-structured in-depth interviews were carried out between November 2013 and August 2014 involving a total of 42 participates in Companies A and B. To understand a holistic design decision-making process during the new product and service development, the sample comprised of a range of design staff in the two companies. As the literature on SRD suggests there is also no limit to the field where design contribute to the delivery of CSR and it is important to understand various types of design inputs in turning the apparitional idea of SRD into an outcome, be it tangible or intangible. Based on the Press and Cooper (1995)’s categorisation of design outcomes, the participating designers largely came from the three distinct design areas: (i) things (product design, packaging design), (ii) place (environmental design), and (iii) messages (user-interface design, user-experience design), each of which all have possible impact to SRD decision making in organisations notably in the context of new product and service development processes (see Figure 2). Of the participating designers, the majority have been their design specialties over 10 years. Interviews lasted approximately one and half hour. All interviews were conducted in Korean and audio-recorded to minimise misinterpretation. All respondents were guaranteed anonymity confidentiality both for themselves and their organisations. Figure 2. Visual description of participant sample. The qualitative analysis usually consists of (i) description of text or narrative data and (ii) applying labels to them (Burns, 2000). In this study, the analysis and interpretation of the qualitative data had several stages: firstly, all the audio-recorded interviews were transcribed and the information from the individual transcripts were summarised. Rather than using preconceived themes or categories, we sought to find as many ideas as possible inductively from the raw data by reading and re-reading the text. Secondly, the meaning units, segments of texts that each contains one main idea (Strauss & Corbin, 1990), were identified. Thirdly, each meaning unit was labelled to capture underlying theme conveyed in each comment. Lastly, all the meaning units were brought together and re-evaluated against the specific purpose of the study. Through the range of iterative process, the goal was to establish the breadth of the SRD issues that can be possibly associated with CSR thinking in the organisations and then to figure out the main factors affecting the designer’s possibility to incorporate social and environmental considerations into their design decision-making process. During the research it became apparent that there are a number of design issues that are associated with socially responsible design thinking within the organisations, either directly or indirectly. Analysis of the data identified the three major contributing factors for designers’ SRD decision-making in an organisational context. Figure 4 depicts the process of identifying the contributing factors for designers’ SRD decision-making, indicating how the organisational drivers of and barriers to SRD implementation affect the designers’ possibility to turn socially responsible design concerns into action. The next step for empirically assessing the current status of SRD decision-making involved determining the extent to which these socially and environmentally responsible solutions were being implemented. A two-phase pragmatic approach to analyse the qualitative data was used in the study with the aim to visualise the two companies’ SRD decision-making models. In the first phase, specific SRD issues were identified and mapped onto the framework of the SRD decision-making, outlined in Figure 1, depending on its initial motivations formed form a larger set of factors within the data. In the subsequent phase, information on the actual implementation of the SRD issue was collected and categorised into three levels: (i) integration of SRD into the formal design process (transition to Quadrant A), (ii) remained in the one time or promotional attempts, not fully integrated into the formal design process (partial movement to Quadrant A), (iii) little or no attempt to actually implement SRD (stayed behind Quadrant B, C, or D), signifying the levels of progress into the CSR-expressed design decision-making on the models (see Figures 5 & 6). Finally, figure 3 depicts the process of creating the two company’s SRD decision-making models, consisting of two-phase qualitative analysis. Figure 3. The process of creating each company’s SRD decision-making model. Figure 4. The qualitative analysis process of identifying SRD themes and its contributing factors. 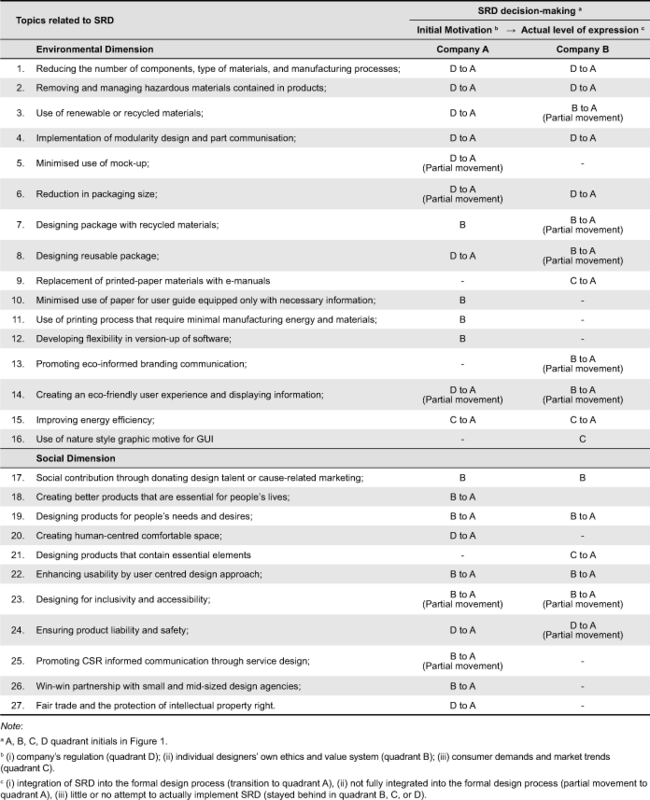 From the interviews we identified a total of twenty-seven topics which appear to be related to environmental and social dimensions of SRD (see Table 1 and Appendix 1 for more detailed information). 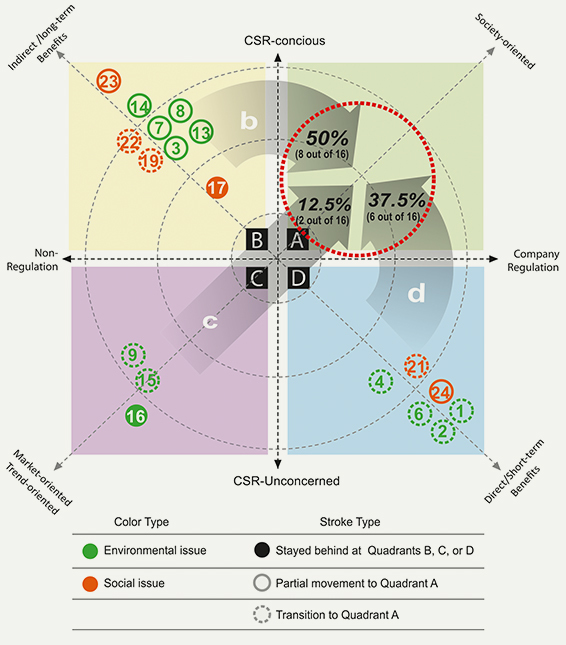 Based on the interview results from the two companies, the underlying motivations behind their socially conscious design decision-making is distinguished as (i) the company’s regulation based on its legal and economic responsibilities (Quadrant D), (ii) individual designers’ own ethics and value system (Quadrant B) and (iii) consumer demands and market trends (Quadrant C) (see Figure 4). Prior occupation of a potential market in developing countries (No. 21). Excessive focus on productivity (No. 26). New market opportunities (No. 23). Several business cases, suggested by some product designer respondents, support this point. A project of ‘waterproof mobile phone’, for instance, has been developed in consideration of people’s living conditions in some regions that have a lot of rain (e.g. Africa and Brazil). The concept was developed by designers who develop products based on local insights and people’s needs and desires. Here is another example of mobile phone project where designers focus on maximising its speaker performance while deleting empty space inside the phone to prevent dust from going into the devise, taking into account the living conditions of the people in a ‘noisy’, ‘messy’ living environment, such as India. These cases also exemplify that through the context-specific, socially conscious design skills and knowledge, the organisation can gain a valuable opportunity to sharpen its competitive edge and trigger the identification of innovative solutions that could create value for business while generally improving social and environmental conditions for a targeted group of people (No. 19, Table 1). Indeed, a critical point in enhancing the likelihood of turning CSR thinking into reality through design lies in identifying the idea of how a socially conscious design decision can move from the Quadrant “B” into the Quadrant “A” and generating appropriate solutions to address the opportunity. Finally, there is another level of decisions that designers make during their design process, which were driven neither by company regulations nor by the ethos of the individuals, but by the increased consumer awareness, and changes in market demand. Here an example, is the company response to energy saving initiatives (No. 15, Table 1), which in the case of the two companies, is initiated to respond quickly to changing market conditions and consumer demand, but later became one of the common product features, being aligned with its corporate strategy. Thus, in terms of the framework, energy saving moved from Quadrant “C” to “A” because the organisation and individuals recognised that this decision-making initiative related to energy saving has a positive effect on the environment. This also made sense from an economic point of view, having arisen through a proactive mandate to explore new market opportunities in product/service development and meeting consumer demand. This example illustrates if demand is expected to be highly socially conscious, obviously the designers will tend to develop products and services with environmental and social attributes to respond to that demand, regardless of whether individual designers or organisations were consciously aware of the importance of implementing SRD into the organisation. In brief, the findings confirm the appropriateness of the three different levels of SRD decision-making. One of the most revealing insights uncovered by the in-depth interviews was that, initially, the vast majority of CRS-expressed design decisions do not simply stem from a purely ethical point of view, but the firm’s legal and economic responsibilities; designers’ own knowledge and practical insights about SRD; or market trends. Furthermore, many of those have been able to move forward to become more proactive and part of formal discussions of CSR within an organisation. Finally the interviews highlighted the need for designers to be aligned with their corporate strategy and included in formal design processes. However, it was also apparent that it was only after individual designers could be fully aware of the significance of incorporation of SRD issues into design processes and top management can clearly articulate the potential social and economic implications of SRD initiatives for their business. Table 1 represents a summary of the SRD issues raised by the interviews, their initial motivation for the SRD decision-making, together with the actual level of expression or implementation of the SRD items within the context of an organisation. Table 1. Index of the SRD topics raised and their possibility for CSR-expressed design decision making. Based on the summary above, each company’s SRD decision-making was mapped on the two dimensional model (see Figures 5 & 6). The two companies’ SRD models demonstrated that the three underlying motivations all act as contributing factors for designers’ SRD decision-making in both organisational context, but the relative influence of the three varies depending on the nature of specific issues. 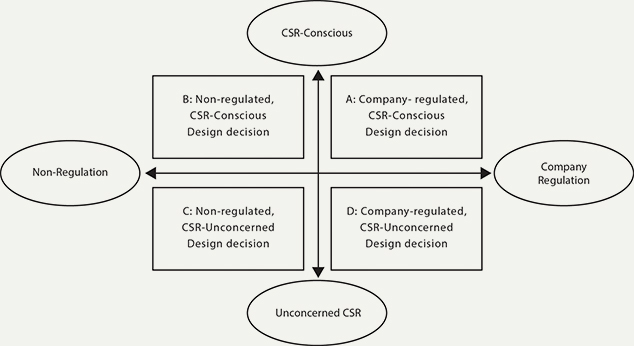 A comparison of the SRD decision making models of the two companies also reveals that in Company A, CSR-expressed design decisions are most strongly influenced by the regulations of the company, representing the highest rates of transition from the quadrants D to A (61%, see Figure 5); on the other hand for Company B, the largest percentage of CSR-expressed decisions (50%, see Fig. 6) are initially originated from the quadrants B although the degrees of incorporation of designer’s socially conscious decisions into crucial corporate strategy and business plan appeared relatively low. It seems that the Company A takes a top-down approach to SRD whilst a bottom-up approach is a more common way SRD occurs in the Company B. For this reason, with some of environmental issues (e.g., No. 3, 7, 8, and 14), the initial motivations for SRD decision making vary according to each organisation’s specific managerial situation in terms of design; that is in the case of Company A, those issues were driven by company policy whilst in Company B, those were driven by individual designers. Therefore, it is of crucial importance to understand what drives or limits designers’ contribution to CSR-expressed decision making in relation to each company’s design management framework. 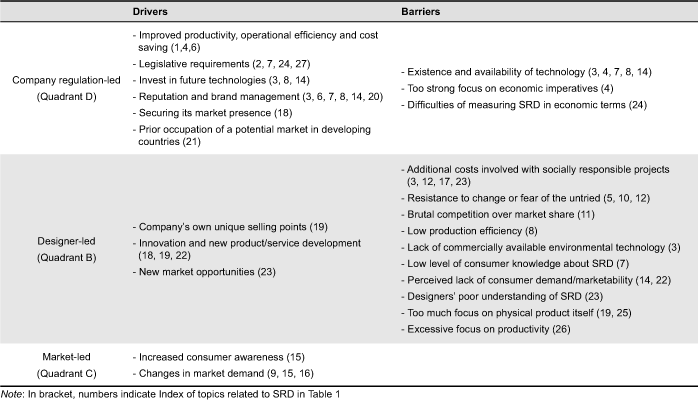 Table 2 illustrates the key drivers and barriers of implementing SRD in the two companies at operational level. Table 2. The key drivers and barriers of implementing SRD in the two companies at operational level. Figure 5. Company A's Dynamic SRD decision-making Model. Figure 6. Company B's Dynamic SRD decision-making Model. The findings from the company interviews reveal how the underlying motivations serve as an impetus for the CSR-expressed design decision-making and operate as the initial stages of transition of SRD practices into the mainstream CSR discussion and policy. These findings expand the initial idea of a two dimensional model by identifying the emergence of the three possible transition stages of SRD: (i) competitive or regulatory-driven SRD, (ii) market- or consumer- driven SRD and (iii) designers’ ethical value-driven SRD, suggesting a possibility of a more dynamic SRD model to operate (Figure 7). Each of the above decision-making approaches to SRD will be discussed in detail below. Figure 7. The dynamic two dimensional model of SRD decision-making. It is not surprising to find that SRD practice is shaped by legal framework mandating that corporations focus on economic performance; thereby corporate designers pursue only those strategies/projects designed to enhance or protect the firm’s position across its relevant market. From the competitive or regulatory point of view, designers tend to follow existing guidelines and regulations to fulfil minimum CSR criteria. In this context, a set of SRD practices were positioned mainly to take advantages of previously unforeseen business opportunities, counter the risk of losing presence in existing markets or establish a presence in emerging ones (e.g. No. 21 in Table 1, i.e. developing a product retaining all basic product functions while keeping the cost down, especially for the underprivileged communities; No. 4 in Table 1, i.e. standardisation of platform or components such as using same LCD panels, button size and chargers across different mobile phone models, etc.). This is in line with the instrumental argument for CSR that centres on market efficiency and risk management (Quazi & O’Brien, 2000). Assuming economic rationality, a designer can only be expected to undertake and sustain so-called socially responsible design activities and initiatives under certain conditions. While some economically motivated SRD initiatives might generate positive or mitigating effects on externalities, they will not ultimately lead toward truly responsible design practices (Manzini, 2007). Indeed, the companies that start SRD practices mainly for cost reduction, the avoidance of regulation, the commercial benefit they enjoy through raising their reputation with the public or with government might not be able to advance the interests of society as a whole (Porter & Kramer, 2011). The interview results also confirm that ‘consumer pull’ can promote SRD practices. However, it was rare and only occurred in very obvious areas that motivated consumers’ purchase behaviour, such as improving energy efficiency. While some writers suggest increasing the number of consumers considered in CSR when making purchasing decisions (Trudel & Cotte, 2009), our case study findings indicate that, in practice, robust linkages between a firm’s SRD initiatives and actual consumer purchasing patterns rarely appear. Although various factors affect the ability and willingness of consumers to purchase socially and environmentally designed products a greater obstacle to the purchase of SRD products, as suggested by most of the interviewees, is that they are liable to be relatively expensive, being of higher quality and consumers are often unable or unwilling to purchase them; they are not ready to pay premium prices for SRD/CSR-embedded goods. This is of considerable importance since most interviewees believed that ideas for new products need to be derived from consumer insights in order to convince the top management of the value of SRD in product development. If consumers or governments currently are to accept only a limited role in SRD development within the organisation then what is the potential contribution of designers to drive SRD and ultimately CSR? The findings of this study certainly confirm that the large numbers of ‘CSR-conscious’ design decisions are being made by designers based on their own ethics and value system yet without having been labelled CSR or SRD. This finding validates that CSR issues are partially and potentially valid in designers’ daily decisions as a form of tacit knowledge. This implies that if designers could articulate what they are doing in terms of SRD, the impact would be greater on truly and genuine conscious decision making toward CSR. Once the socially conscious design practices are recognised within an organisation, they have something more of regulatory status and become embedded in the process; then SRD will eventually become a part of formal process for hundreds of new product deployment projects going on within the company. Based on the study findings, it becomes apparent that the designer’s sense of responsibility and their willingness to incorporate it with their design processes are key contributing factors to CSR-expressed design-decision making within an organisation. This further raises the question as to how they can be clearly articulated within an organisation, fully embedded, and widespread in the organisational process. This study set out to investigate the role of designers in integrating societal value in the product and service development processes, and to illustrate how a realisation of the principles of CSR can be achieved through design within an organisation, with the potential to make a number of contributions to theory and practice in both design management and CSR management areas. The followings are the main research contributions of this study. The corporate decision-making process is dominated by the economic imperative (i.e. improved productivity, operational efficiency and cost saving; reputation and brand management initiatives; securing its market presence; prior occupation of a potential market in developing countries, etc. ), which ultimately determines the extent to which social and environmental issues are integrated into the core business strategy of the companies as well as SRD decision-making process. Within an overarching approach of economic rationality, ‘competitive- or regulatory-driven SRD’ practices is thus unlikely to promote more than superficial expressions or incremental improvements within the firms because structural and legal environments admit only instrumental forms of SRD (Porter & Kramer, 2011). One of the most important impetuses for SRD may be attributed to the individual designers’ own insights and knowledge originated with their ethos. Yet, it is not straight forward as was initially reviewed in the literature and there are a range of factors which restrict or limit this opportunity from becoming reality. The study therefore provides a recognition that organisations and design managers need to develop effective management frameworks and processes that can help reflection on SRD by practical designers within their corporations. Further in-depth research on what design management approach best incorporates CSR thinking into ‘design’ (or vice versa) is therefore recommended, to understand the dimensions of problems in the current design management processes and to generate ideas for alternative design management approaches that better reflect the principles of CSR/SRD, notably during the new product development processes. What is an appropriate role of design managers in actually driving a firm’s SRD initiatives and instilling an ethos for CSR behaviours in the practice of designers? ; How designers can improve SRD-related skills and competencies? ; What sorts of organisational learning process are needed to facilitate CSR/SRD-related knowledge accumulation and innovation, at both the project and individual level and thus communicate the idea of ‘socially responsible design’ throughout the company? In the field of design management, especially for SRD decision-making, theory is remains underdeveloped, so this research is a step towards building a more robust theory. It contributes to the literature by addressing the relationship between design and CSR policy (i) highlighting the importance of interaction between the designers’ personal ethical values and the firm’s level of CSR, and (ii) presenting models for SRD decision-making. Grounding from systematic analysis of empirical data gathered from multinational electronics companies and using an adapted grounded approach, the conceptual model proposed is original and seeks to provide a comprehensive way to integrate CSR thinking into design/NPD process. Overall, the proposed model allows better understanding of the relationship between designers’ conscious awareness of SRD and a company’s commitment to CSR, which seems essential to integrating CSR into ‘design’ within an organisational structure or vice versa. Furthermore, the knowledge resulting from this type of research can contribute greatly to the design professions affiliated with corporations, providing a reflective tool for their SRD practice. It is also informative to the CSR managers when considering the actual implementation of their CSR goals through the products and service they provide. Ambert, A., Adler, P. A., Adler, P., & Detzner, D. F. (1995). Understanding and Evaluating Qualitative Research. Journal of Marriage and Family, 57(4). 879-893. Benbasat, I., Goldstein, D.K. & Mead, M. (1987). The Case Research Strategy in Studies of Information Systems. MIS Quarterly, 11(3). 369-386. Bhamra, T., & Lofthouse, V. (2007). Design for sustainability: A practical approach. Hampshire, UK: Gower Publishing. Bhamra, T., Lilley, D., & Tang, T. (2011). Design for sustainable behaviour: Using products to change consumer behaviour. The Design Journal, 14(4). 427-445. Buchanan, R. (2000). Good design in the digital age. AIGA Journal of Design for the Network Economy, 1(1). 1-5. Burns, R. (2000). Introduction to research methods (4th Ed.). London, UK: Sage. Chick, A., & Micklethwaite, P. (2011). Designing sustainable change: How design and designers can drive the sustainability agenda. London, UK: AVA Publishing. Cooper, R. (2005). Ethics and altruism: What constitutes socially responsible design? Design Management Review, 16(3). 10-18. Dewberry, E. (2000). Lesson from ecodesign. In S. Learmount, M. Press, & R. Cooper (Eds. ), Design against crime: Report for the Design Council (pp. 127-146). London, UK: Home Office and Department of Trade and Industry. Doordan, D. P. (2013). Developing theories for sustainable design. In S. Walker & J. Giard (Eds. ), The handbook of design for sustainability. London, UK: Bloomsbury Publishing. Dowlatshahi, S. (1994). A comparison of approaches to concurrent engineering. The International Journal of Advanced Manufacturing Technology, 9(2). 106-113. Esslinger, H. (2009). A fine line: How design strategies are shaping the future of business. San Francisco, CA: John Wiley & Sons. Fiksel, J. R. (2009). 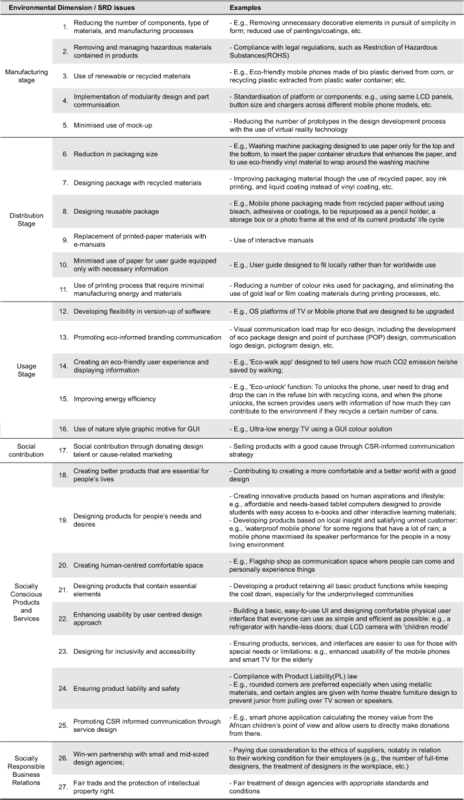 Design for environment: A guide to sustainable product development. New York, NY: McGraw-Hill. Fuad-Luke, A (2009). Design activism. London, UK: Earthscan. Glaser, B. G. (2001). The grounded theory perspective: Conceptualization contrasted with description. San Francisco, CA: Sociology Press. Wallis, C. (2005, January 09). The new science of happiness. Time Magazine. Retrieved from July 15, 2006. Karna, J., Hansen, E., & Heikki, J. (2003). Social responsibility in environmental marketing planning. European Journal of Marketing, 37(5/6), 848-871. Lapan, S. D., & Quartaroli, M. T. (2009). Research essentials: An introduction to design and practices. San Francisco, CA: Jossey-Bass. Lofthouse, V. A. (2011). Facilitating ecodesign in an industrial design context: An exploratory study. Bedford, UK: Cranfield University. Manzini, E. (2007). Design research for sustainable social innovation. In R. Michel (Ed. ), Design research now: Essays and selected projects (pp. 233-245). Basel, Switzerland: Birkhauser Verlag. McAloone, T. (1998). Industry experience of environmentally conscious design integration: An exploratory study (Unpublished doctorial thesis). Cranfield, UK: Cranfield University. Morelli N. (2007). Social innovation and new industrial contexts: Can designers “industrialize” socially responsible solutions? Design Issues, 23(4), 3-21. Papanek, V. J. (1971). Design for the real world: Human ecology and social change. London, UK: Thames and Hudson. Porter, M. E., & Kramer, M. R. (2006). Strategy & society: The link between competitive advantage and corporate social responsibility. Harvard Business Review, 84(12), 78-92. Porter, M., & Kramer, M (2011). Creating shared value. Harvard Business Review, 89(1/2), 62-77. Press, M., & Cooper, R. (1995). The design agenda: A guide to successful design management. Chichester, UK: John Wiley & Sons. Quazi, A. M., & O’Brien, D. (2000). An empirical test of a cross-national model of corporate social responsibility. Journal of Business Ethics, 25, 33-51. Rangan, K., Chase, L. A., & Karim, S. (2015). The truth about CSR. Harvard Business Review, 93(1/2), 40-49. Rowe, M. (2006). Reputation relationships and risk: A CSR primer for ethics officers. Business and Society Review, 111(4), 441-455. Robson, C. (2007). How to do a Research Project: A Guide for Undergraduate Students. Oxford, UK: Blackwell Publishing Ltd.
Shedroff, N. (2009). Design is the problem: The future of design must be sustainable. New York, NY: Louis Rosenfeld. Stegall, N. (2006). Designing for sustainability: A philosophy for ecologically intentional design. Design Issues, 22(2), 56-63. Stenbacka, C. (2001). Qualitative research requires quality concepts of its own. Management Decision, 39(7), 551-555. Swanson, D. L. (2014). Embedding CSR into corporate culture: Challenging the executive mind. Hampshire, UK: Palgrave Macmillan. Trudel, R. & Cotte, J. (2009). Does it pay to be good. MIT/Sloan Management Review, 50(2), 61-68. Van Hemel, C. (1998). Eco design empirically explored: Design for environment in Dutch small and medium sized enterprises. Delft, the Netherlands: Delft University of Technology. Vezzoli, C. & Manzini, E. (2008). Design for environmental sustainability. London, UK: Springer. Waldman, D. A., Sully de Luque, M., Washburn, N., & House, R. J. (2006) Cultural and leadership predictors of corporate social responsibility values of top management: a globe study of 15 countries. Journal of International Business Studies, 37, 823-837. Wheeler, D, Colbert, B., & Freeman, R. E. (2003). Focusing on value: Reconciling corporate social responsibility, sustainability and a stakeholder approach in a network world. Journal of General Management, 28(3), 1-28. Whiteley, N. (1993). Design for society. London, UK: Reaktion Books. Yin, R. (2003). Case Study Research: Design and Methods (3rd ed.). Thousand Oaks, CA: Sage. Appendix 1. The SRD practices related to the environmental and social dimension of CSR.